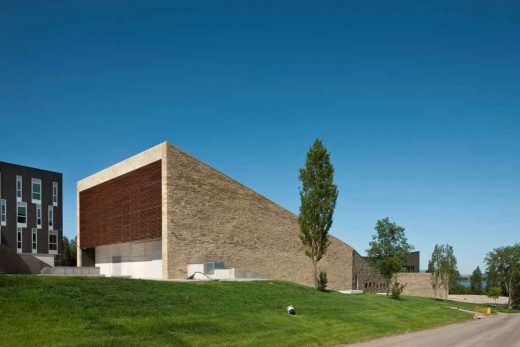 In the estate of La Grajera, west of the city of Logroño and only a few yards from the Camino de Santiago, we find the Institutional Winery of La Grajera. The Project seeks an equilibrium between the need to announce the presence of the winery and the desire to merge with the landscape: the volumes follow the deformations of the land and are interrupted, moving towards the forest, remaining close to its border and thus respecting the existing vegetation. 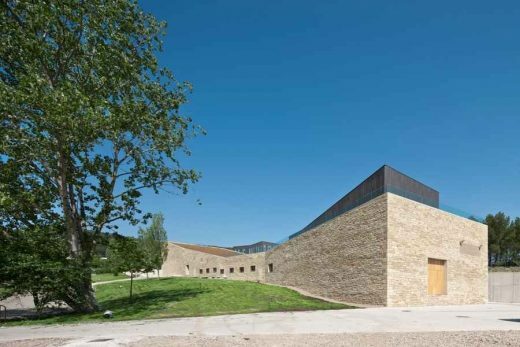 A large semi-basement foundation in sandstone, which houses the production area of the winery, bends and rises to become an element of the building and to turn into an element of the landscape. 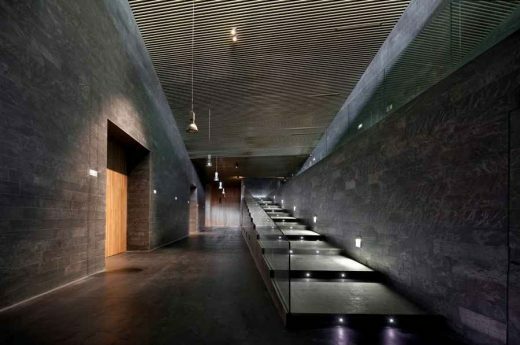 Before this massive construction, the institutional part of the winery is materialized in a light, amplified body in glass and dark ceramic. 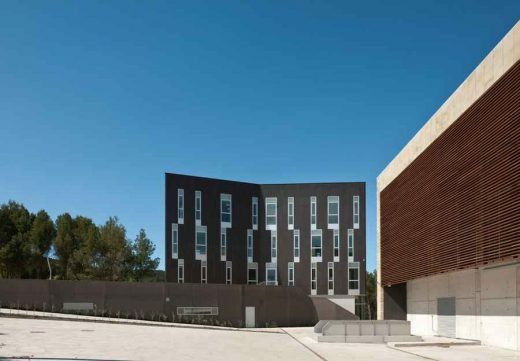 The third volume, a small tower housing offices, completes and closes the building, helping to create the pedestrian square that gives access to the different areas: a piazza that is open to the forest, to the landscape and to the panorama. 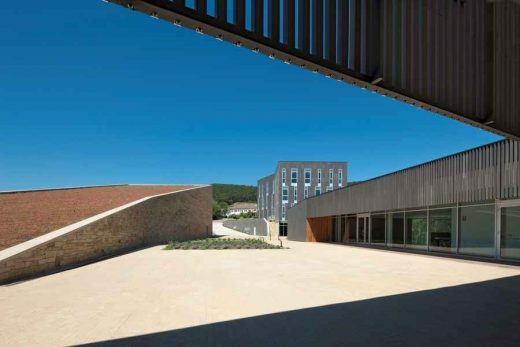 The presence of two entrances on different heights makes it possible for the winery to remain partly below ground, exploiting the slope of the land; this favours many aspects of the manufacturing process, as for instance the constant temperature of the ground and the use of gravity or natural ventilation. The material chosen change from the bright exterior to the interior in dark stone, in a didactic itinerary along which it is possible to participate in all the phases of wine brewing, from the growing of grapes to the tasting of the product. The building aims to find simple bioclimatic solutions that harmonize with the climate and with the location. The inhabitable areas face south, and protect the areas dedicated to production and fermentation, which remain underground and covered by the hill, thus reducing the need for air conditioning. The inclined roof is covered by vegetation which, apart from helping the building merge with the landscape, increases the thermal insulation. 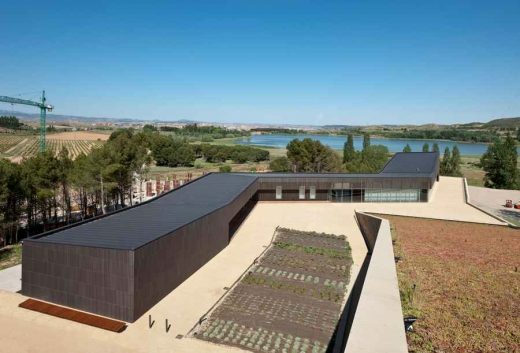 The orientation and section of the winery makes it possible to guarantee a natural ventilation of the building, and reduce the need of mechanical ventilation for the industrial process. 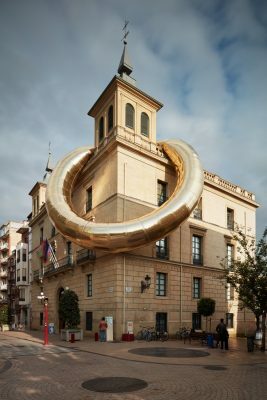 Among the construction systems, a ceramic element used on the facade deserves particular mention; it has been designed by the Virai Arquitectos firm together with the Spanish Favetón company. The need to build shutters to protect the large glazed fronts of the institutional pavilion more efficiently from the sun has made it necessary to find a material that could behave homogeneously in the opaque zones of the façade and in the transparent ones of the shutters.